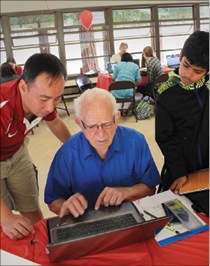 More than 60 local seniors improved their abilities to use personal computing devices at “Tech Day for Older Adults” at the Los Altos Senior Center May 17. The free service project was co-hosted by the Palo Alto Medical Foundation’s David Druker Center for Health Systems Innovation linkAges TimeBank and the Los Altos Recreation Department. Partners included the Egan Junior High School PTA, the Bullis Charter School Booster Club, the Center for Age Friendly Excellence and the Stanford Alumni Association. An estimated 80 volunteers taught seniors how to chat with friends and family via Skype and FaceTime; create a Facebook account; use laptops, tablets and smartphones; and participate in the linkAges TimeBank, a free service exchange network for all ages. The event included residents of a range of ages, from teens to 80s. Egan Junior High and Bullis Charter School students appreciated the interaction with seniors. Kim Albright, Egan PTA president, praised the partnerships formed to host the event. “We are glad to partner with the Bullis Boosters Club and linkAges TimeBank to facilitate this unique opportunity to serve and interact with a different generation of adults … right here in our own community,” she said. A team from the Druker Center provided information on the components of linkAges, a multigenerational network that supports aging in the community. Members of the linkAges TimeBank were on hand to put into practice their community-building skills with seniors. Alan Baker helped a senior optimize network connectivity and performed a general computer tuneup. “TimeBanking is a great community builder in places where you didn’t know there was a community,” he said. According to organizers, “Tech Day for Older Adults” embodied the concept of linkAges – linking ages for intergenerational teaching, learning and building community. “These multigenerational exchanges and networks help to build a better future and change lives,” said Los Altos resident Anabel Pelham, professor of gerontology at San Francisco State University and founding director of the Center for Age-Friendly Excellence.